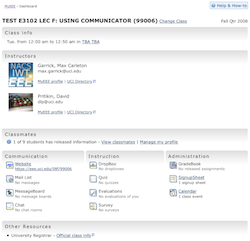 Canvas is a learning management system (LMS) developed by Instructure. OIT is piloting Canvas as a complement to the EEE LMS. More information about Canvas and EEE can be found on the Canvas Pilot web site. UCI’s year-long Canvas Pilot kicked off March 30th with the start of Spring instruction. The Canvas Pilot is an opportunity for instructors, teaching assistants, and students to use Canvas in their courses and participate in a formal assessment of the value and usability of Canvas as a potential addition to the instructional technology ecosystem at UCI. Canvas was implemented for UCI during Winter quarter. During that time, the EEE team completed infrastructural development work including MyEEE integration, EEE assistants integration, UCI branding, WebAuth (UCInetID login) integration, and a data management utility to synchronize our campus Canvas instance with appropriate instructor, teaching assistant, student, course, and enrollment data for participating pilot courses. We identified an initial group of early adopter instructors, created their Canvas course spaces, and (optionally) provided: EEE content migration, three-hour hands-on training workshops, as-needed support and consultation, and an informal pilot participant meet-up (this will be an ongoing, recurring event). Participating instructors, TAs, and students were invited to complete their first pilot assessment activity: short, pre-quarter surveys designed to gather information on expectations and prior experiences in Canvas before the quarter is in full swing. Those surveys conclude Friday, April 3rd (end of the first week of classes). The Canvas Pilot website (http://sites.uci.edu/canvaspilot/) was launched shortly before Winter Recess and has been updated throughout the quarter with new information, including a feature comparison page (http://sites.uci.edu/canvaspilot/comparison/), info for students (http://sites.uci.edu/canvaspilot/students/), a list of participating courses (http://sites.uci.edu/canvaspilot/participants/) and an assessment timeline (http://sites.uci.edu/canvaspilot/about-canvas-pilot/). The EEE team also developed and launched a new EEE Help Center (http://help.eee.uci.edu/) with a dedicated Canvas Pilot section (http://help.eee.uci.edu/canvas/) that will be expanded as-needed based on campus feedback and support interactions. We coordinated a new component of the formal assessment in collaboration with Donald Bren School of Information & Computer Sciences Professor Alfred Kobsa, who has tasked several groups in his undergraduate project class on user interface design and evaluation with conducting a usability evaluation of Canvas. Professor Kobsa’s students have previously reviewed the EEE website and worked with campus groups including the UCI Libraries and Distance Learning Center. They bring a fresh perspective and valuable skill set to this process. As of March 26th, the pilot participants in Spring courses include: 6,083 students, 136 instructors, and 67 teaching assistants. Next steps for the Canvas Pilot in the upcoming Spring 2015 quarter include mid- and post-quarter assessment surveys, student focus groups, info sessions (For instructors: https://eee.uci.edu/workshop/sg / TAs: https://eee.uci.edu/workshop/yg / Students: (https://eee.uci.edu/workshop/tg), and coordination with University Extension, the Distance Leanring Center, and Summer Session around participating Summer courses (both online and on-the-ground). Have you ever been curious to know how much UCI’s Electronic Educational Environment is being used across campus? We’ve prepared a report summarizing EEE use for the 2010-2011 academic year. EEE provides tools for instructors to use in their courses, including class roster management, gradebook management, web site development, and others. EEE also provides the Survey tool for all faculty and staff to use to prepare quizzes, surveys, and questionnaires, and to collect and analyze responses. Have you ever been curious to know how much EEE is being used across campus? Ever wondered just how many hits the website gets or how much data is transferred? We’ve prepared a report summarizing EEE use for Winter 2011.